October 14, 2017 - Rockford, Michigan: Century A&E kicked-off their United Way campaign this year knee deep in mud. 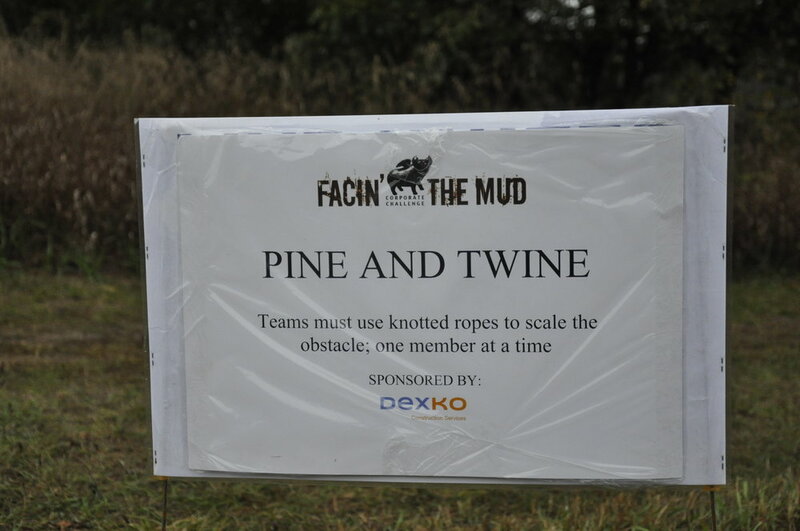 United Way - Heart of West Michigan held their second annual Facin' the Mud corporate challenge last week and Century jumped at the chance to help raise awareness and funding for the needs of our local community. The challenge included a 5k race, mud crawling, team wall climbing and daunting obstacles designed to thwart progress towards the finish line. Regardless of the dangers that lie ahead, it didn't take long for Century to find six highly competitive engineers anxious to take the challenge. The "Crahen Crushers" took to the field on Saturday morning, with dreams of bringing the coveted "Flying Pig" trophy home to Century A&E. Despite their best efforts, a first place finish just wasn't in the cards. Team Bank of America 1 took home the "Pig" this year with a chip time of 30:13.1. The Crahen Crusher finished in the middle of the pack with a respectable time of 44:02.3, but that wasn't good enough for Century co-founder, Matt Tipping. "If you take the average age of our team versus the average age on the field, we can divide that number from the average field time and interpolate the true finish time. Based on that factor, surely, we would have been the victors. ", calculated Matt.... literally, using his iPhone. In all seriousness, however, the Crahen Crushers had a great time and conquered a difficult challenge for a truly good cause within our community. All six of the Crushers are likely to return to the challenges they faced in the mud next year, only a little stronger, faster - and slightly wiser. If you would like to learn more about Facin' the Mud corporate challenge, check out their website HERE. Click HERE for a comprehensive breakdown of the teams involved and their respective finish times. MAY 2016 - At Century A&E, we are firm believers in supporting the community that supports us. And it is no secret that we love to design new facilities, so we asked - how can we use our unique talents to give back to our community? After a long Michigan winter we were anxious to get outside this spring season and help where we could, so we placed a call into United Way to inquire about any suitable projects an A&E firm might lend itself well towards. They connected us to the Girl Scouts of Michigan Shore to Shore organization that was looking for assistance with a project in Greenville. Camp Anna Behrens was in the process of replacing two cabins with new yurts and needed help building the foundation and floors - a perfect fit for our talented engineers. "Several of us at Century A&E are parents of boy scouts and girls scouts. ", says Century's Ivan Ivanov, an active member of the Boy Scouts of America. "It's a neat way to give back to the community beyond popcorn and cookie sales - through involvement." While yurts were largely foreign to us at Century, a little information gathering and engineering know-how produced a workable layout plan in a day or so. Afterwards, we "Centurions" packed up our tools and headed to Greenville where scout leaders Chris Sodini and Pattie Sanderson were waiting for our arrival. For the most part, installing the foundations went smoothly. Constructing the flooring of the yurts, however, presented a real problem. The 16' lengths of tongue and groove floorboard were often warped leaving large gaps between the boards. Resident problem solver Chuck Bergman (inventor of the Crease-O-Matic) teamed up with structural guru Dan Esch to engineer a solution - the "Bergman Persuader". This simple machine proved to be an invaluable tool for correcting the gaps while installing the floorboards; a single operator would apply downward force to the inertia lever while the Persuader converted the energy to lateral pressure on the target board - at a five to one ratio. Our engineered solution - the "Bergman Persuader"
Some Centurions, however, had others ideas on how to reduce gaps between the floorboards. "Just grab a ratcheting strap and a tire iron, that oughta do the trick", spouted electrical sharpshooter, Ed Schindorf. With some of us on straps, others on the Persuaders and several more on drills, we really fell into an efficient system of securing the floorboards precisely to the foundation. Just as we found our groove (pun intended), building materials came up short. We are anxious to return to Greenville to finish the job, just as soon as the sun sneaks past the Michigan clouds. Our volunteer crew had a splendid time so far at beautiful Camp Anna Behrens; many thanks go out to Chris and Pattie for providing us lunch during our effort. If you would like more information on how you can volunteer to help your local Michigan scouts, take a web cruise over to the Girl Scouts of Michigan Shore to Shore website HERE.